In general terms, an experiment is something that you do for either validate or reject a hypothesis. That something is an organized and controlled procedure that should be able to be replicated in a similar scenario following a specific set of instructions. But experiment is not an easy concept. When we talk about doing an experiment we have to put generalizations away and going to to the specific. There are different magnitudes, levels, and logics involved in an experimental process, some of them are even challenging the general definition of this particular notion. So, an experiment is a practice that scientific people use to do: a chemist, a physicist, a biologist, someone that wears a lab coat for work. But also policymakers and bureaucrats do experiments; regular citizens in their daily life too. We have, thus, an activity that has the capacity of being translated to different contexts and scenarios. The pedestrianization of Times Square is, for instance, a long-term experiment produced by a series of experimental procedures in different spaces and disparate fields such as architecture, urbanism, public politics, surveillance, tourism, and daily life. The date was February 29, 2009. The place was the Marriott Marquis Hotel in Times Square. The intention was announcing a pilot program for reducing the traffic congestion in Midtown Manhattan. The proposed plan was temporary closing Broadway for vehicles from 47th Street to 42nd Street and from 35th Street to 33rd Street. It means making Broadway a pedestrian way around Times Square and Herald square, respectively. The protagonists of the announcement were Mayor Michael Bloomberg and Department of Transportation Commissioner Janette Sadik-Khan. A pilot program is a way of naming a small-scale experiment. In a nutshell, it works as a trial or as an explorative version which logic is to test the features, procedures, and implementations of a bigger-scale experiment. The dimensions and meanings of a small-scale experiment depend on the particular intention of each program. In the case of closing Broadway to vehicular traffic, the scale of the pilot program was measured in terms of time. The duration of this experiment was settled until the end of the year. Times Square is a bottleneck that has a bad metonymy as a name: It is everything but squared. The way how Broadway is crossing Manhattan, defying the rectangle-grid-design of the island, produced four narrow triangles in its encounters with the Seventh and the Sixth Avenues: Times Square and Herald Square. Nevertheless, those are not the only triangles in the quadrilateral Manhattan’s street design. All of them were the product of juxtaposing Commissioners’ Plan of 181’s definitive grid over the previous roads that were either significant for the mobility at that time or that the commissioners thought it could disappear soon. Broadway was part of the last group. Below, you can see two vehicular maps of the area surrounding Times Square. Please take a look at the left one and appreciate the way how Broadway was crossing the Seventh Avenue, disrupting the squared order of the traffic of Manhattan. 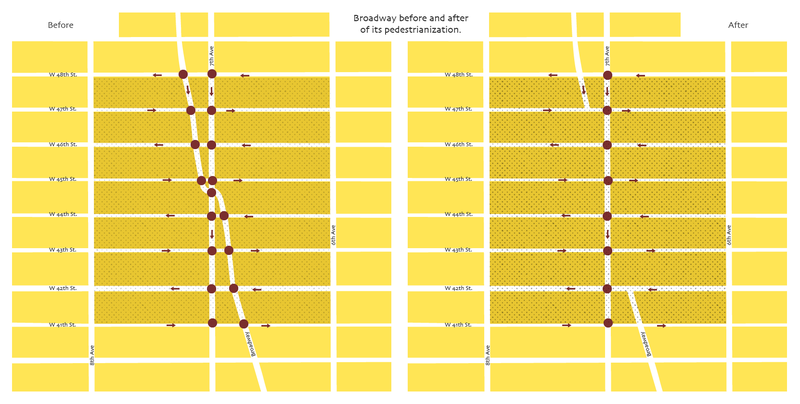 Then, observe the right one and see the simplification in the mobility that implied to remove Broadway of the roadway grid. The red dots indicate in both maps the traffic lights and encounter points of vehicles-vehicles and vehicles-pedestrians. Imagine you driving in the first scenario along Broadway. Try to dimension the pedestrian crossings, the traffic lights, the thousands of vehicles trapped in that bottleneck, the crowds of tourists walking from one side to the another, the confusing intersection between the avenues, the slowness for advancing. During many decades, that was the daily situation of the area surrounding Times Square. Congestion, mobility, and safety issues were some side effects of the attempts to revitalize the zone in the ‘90s and making Times Square a tourist attraction. Now suppose you are a pedestrian in the Times Square of the first scenario. Take a look around you and appreciate the other thousands of people that, as you do, are visiting the place. Everyone is distracted either shopping, watching the screens, walking. Suddenly, this triangle Square is not enough for all of the pedestrians. Many of them are standing over the roadway. Also, the time in the traffic light is not enough either. There are many people crossing the streets, in both directions, when the pedestrian signs are still red. Meanwhile, the cars are honking and dodging bodies. Everyone is in a hurry, everything is a chaos. This pilot program, as well as the whole plan for pedestrianizing Broadway, can be categorized under the label of “field experimentation.” In fact, any urban experiment is a field experiment. The additive “urban” implies a procedure carried out in a city landscape such as a street, a park, a subway station, a neighborhood. In a broad sense, the category “field experiment” is gathering all those outside-laboratory (semi)controlled procedures that need specific real-life environments for being developed. Experimenting in urban areas is nothing new. Cities have always been experimental (Karvonen 2014) entanglements and scenarios for testing —for instance— political, economical, biological, and social hypothesis and theories. This sort of testbed characteristic can be traced along the history, but nowadays the study of the relationship urban-experiment has acquired a major academic relevance (Wilks-Heeg 1996; Hinchliffe et al. 2005, Evans et al. 2016) under the umbrella of discussions about urbanization modes (Brenner & Schmid 2015, Sheepard et al. 2015, Rickards 2016, Storper & Scott 2016) and about the smart city boom (Chatterton 2010, Hajer & Dassen 2014, Verrest & Pfeffer 2018. An urban experiment is a complex structure that involves a big set of elements participating, as well as different moments and scenarios, logics and situations. We have human and non-human agents; we have a field, a laboratory, a public, an organized plan, a budget, allies, counterparts, different participatory levels, discourses and theoretical constructs. We also have uncertainty. Nonetheless, each urban experiment results to be a particular case and we cannot talk about a general theory for approaching them. Closing temporally Broadway to vehicular traffic between 42nd Street to 47th Street implied a completely restructuring process of the whole area. The diagonal avenue changed its use and kind of relationship with the other elements around. Along the 2019, and in a stepped form (the pilot program was announced in February, started in May and completed in August), Broadway started its transformation from being one of the most concurrent ways for crossing Midtown southbound to a prototype of a kind of plaza, a place not only for walking but also for resting and for staying there. Changing the usage and nature of a street requires a re-domestication process. In other words, we are talking about an urban scenario being re-territorialized and conquered in order to materialize a political point of view about how that place should work. The cars were displaced to new routes, traffic lights were adjusted with 66% more green time, the flow of pedestrians were sprawled to new spaces, and temporal cheap furniture arrived. “Welcome to Times Chair: the crossed legs of the world,” said Amber Sutherland, in an article for the New York Post, talking about the 376 chairs ($15 per unity) that were deployed across Times Square. After a process of evaluation, that temporal pilot program became permanent. The decision was announced in February 2010 with the presentation of an Evaluation report by the City Administration. The document was mainly focused on the mobility and safety aspects. The positive results in both scenarios convinced mayor Bloomberg of closing Broadway permanently. The light was finally green, and the redevelopment just started.